Understanding and Using URL's - This page presents the definition and basic structure of a Uniform Resource Locator (URL). Some instruction on how to use a URL is given as well as what steps to follow when you see the "404 - File not Found" error. Navigating with Internet Explorer Buttons - A tutorial on how to use the components of the Standard Button toolbar. Instructions are included for how to customize the toolbar. 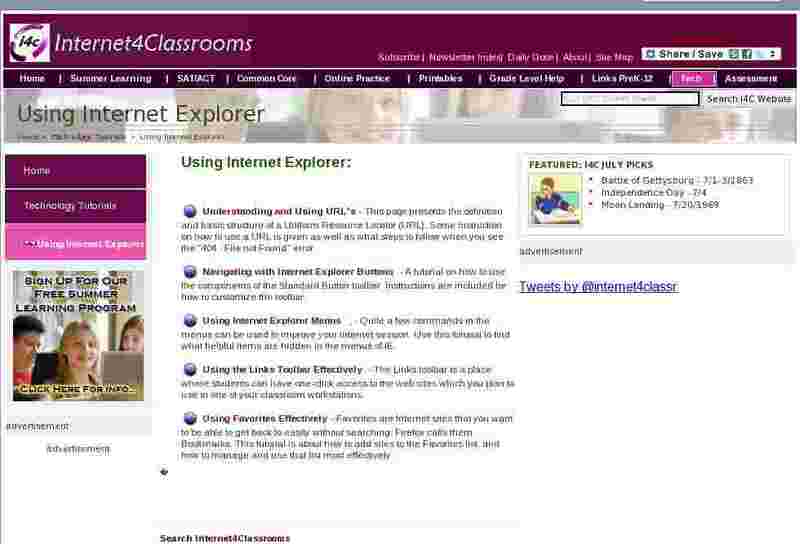 Using Internet Explorer Menus � - Quite a few commands in the menus can be used to improve your Internet session. Use this tutorial to find what helpful items are hidden in the menus of IE. Using the Links Toolbar Effectively - The Links toolbar is a place where students can have one-click access to the web sites which you plan to use in one of your classroom workstations. Using Favorites Effectively - Favorites are Internet sites that you want to be able to get back to easily without searching. Firefox calls them Bookmarks. This tutorial is about how to add sites to the Favorites list, and how to manage and use that list most effectively.